CALIFORNIA DREAMIN’: The 2008 National League Champion Chicago Cubs tonight play Game Three of the National League Division Series against Los Angeles at Dodger Stadium … the Cubs are down two-games-to-none in this best-of-five series after dropping Game Two to the Dodgers, 10-3, at Wrigley Field Thursday night. On September 20, the Cubs clinched their 16th post-season appearance in franchise history with their second-straight N.L. Central Division title … of the six division winners last year, only the Cubs, Phillies and Angels repeated as division champs. FIRST IMPRESSIONS: Tonight marks Cubs hurler Rich Harden’s first career start against the Dodgers … the righthander is 5-1 with a 1.88 ERA (13 ER/62.1 IP) in his last 10 outings in which he’s starting against a club for the first time – he has allowed two or fewer earned runs in nine of those starts dating to June 24, 2004 vs. the Giants. In 2008, Harden made his first career start against an opponent eight times … he went 4-1 with a 1.86 ERA (11 ER/53.1 IP) in those games, walking 12 and striking out 66. TURN IT AROUND: Rich Harden owns a 17-10 record with a 3.52 ERA in 48 career starts following a loss … this season, Harden had a 2.76 ERA (19 ER/62.0 IP) with a 3-1 record following his team’s losses between the Cubs and Oakland. ONE MORE JACK KEROUAC REFERENCE: The Cubs were 42-38 (.506) on the road in 2008, one of four N.L. clubs with a winning road record, joining the Phillies (44-37), Brewers (41-40) and Mets (41-40) … Chicago was 21-8 in its final 29 road contests, including a nine-game road winning streak from July 23-August 15 – it was the Cubs longest road winning streak in 63 years when the 1945 squad enjoyed a 12-game road winning streak fromJuly 1-August 3. VETERAN STATUS: Joe Torre (4,005) and Lou Piniella (3,262) have combined to manage 7,267 regular-season major-league games, the most combined games for two managers opposing each other in the postseason … they broke the record set in the 2006 World Series, when Tony LaRussa opposed Jim Leyland (6,651 total games) … thanks to Elias Sports Bureau. This is the third time Piniella and Torre have met in the postseason as managers, the first in the National League … Torre’s New York Yankees twice defeated Piniella’s Seattle Mariners in the ALCS in 2000 and 2001. This NLDS match-up features the lone skippers in major league history with at least 1,700 hits as a player and 1,700 wins as a manager. FOURTH OCTOBER: With an inning pitched Thursday, Kerry Wood became the 14th player in franchise history to appear in four different postseasons, and the first since Stan Hack in 1945 … Wood previously appeared in the playoffs in 1998, 2003 and 2007 … Wood is the seventh pitcher to appear in four postseasons, the first since Charlie Root (1929, 1932, 1935 and 1938). LOU’S CREW: Cubs Manager Lou Piniella, who Tuesday had his 2010 club option exercised, guided the club to the best record in the National League this season … with 97 victories, he collected the second-most wins in any of his 21 seasons as a big league manager, trailing only his 2001 Seattle Mariners that won 116 games. I am cautiously optimistic....and anxiously apprehensive. As the clock ticks away, my stomach ticks right along with it. I tell ya what.... my internet has been down all day.... my son is gone for the weekend, and I was really wondering how I was going to get through this game sanely without any moral support..... I've never been so happy to get on fogpog!!!!!! I hear you Heather...I keep bouncing around the net looking for something new to read to keep my mind off of things for the next hour and a half. Also, I find it strange to sit here and pull for the Brew Crew, if for no other reason than to tire out the Phillies a little bit. 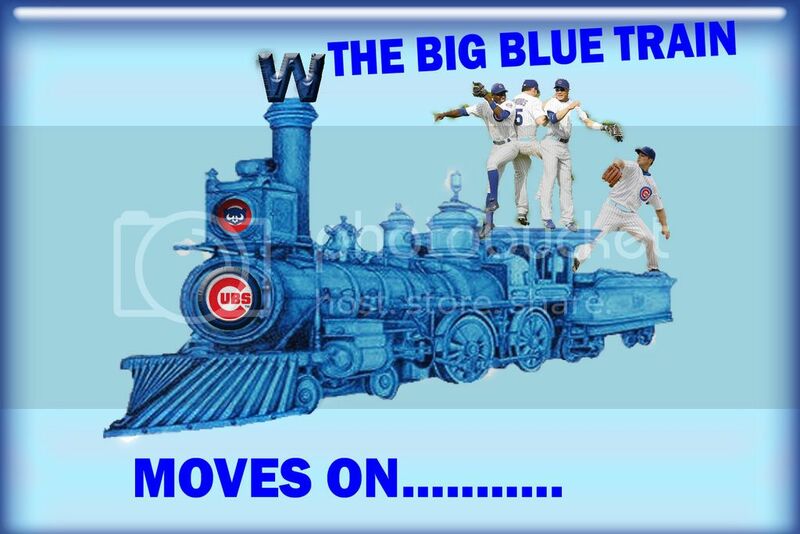 I do think it would be awesome if us and them could both come back from 0-2, as that would be a sweet NLCS! One game at a time. I'm not having much success getting my mind onto other things, so I keep ending up back here. I am rooting for the Brewers.... but more because it is giving me the confidence that if they can pull it off, we certainly can! I just talked to Aramfan (mara) a bit ago. She is going out to watch the game tonight with some friends, and she is feeling the same.... I am soooo antsy, yet, scared, yet, excited, yet worried, yet anxious.....and sooooo many more emotions. BTW... scoreboard update.... end of 5, Brew Crew is up 3-0 and starter Jamie Moyer is out of the game for the Phillies. Dave Bush is pitching a good game tonight.